Death of a Ghost. Great to be back in Lochdubh. 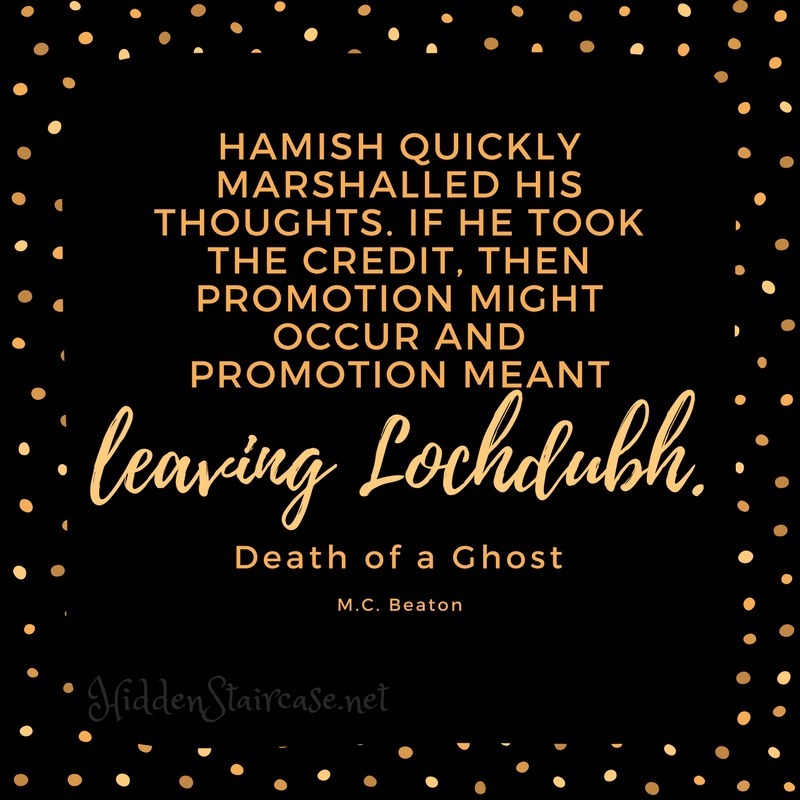 I always look forward to the release of a new Hamish Macbeth mystery each year. In fact, Hamish is probably my favorite cozy mystery series. The small town of Lochdubh in northern Scotland provides a perfect setting for the lazy policeman who wants nothing more than to look after his beat while raising a few sheep and sharing a day fishing with his pets. N ow I have to admit, Hamish books are…comfortable. While the mystery is different in each one, there are certain things a regular reader anticipates in each book. I know I do complain about these things in the Stephanie Plum series, because it just feels like Ms. Evanovich is recycling the first seven books of the series with a different cover with each new release. With Hamish, it feels different. There are things in addition to the mystery that I’ve come to expect. It’s like eating your favorite comfort food that your mom used to make when you were little. The recipe you make is a little different, but those subtleties that you love are still there. If Hamish isn’t pining after one of his two serious relationships (Priscilla or Elspeth), he is probably either madly in love with a pretty face, or attempting to ditch whoever he’s been seeing. Throughout the book, his pets will be left with Angela Brodie, eat at the Italian restaurant, and travel with Hamish to a crime scene or interview. Blair will have some new crazy scheme to get rid of Macbeth once and for all, which will backfire. Also he will probably be drunk at some point. We will see the Currie sisters (and possibly the minister’s wife) chastise Hamish for his womanizing ways. Hamish will be struggling to both solve a case AND appear to be slow-witted so as not to be promoted to Strathbane and lose his beloved police station in Lochdubh. Of course, the mystery is always unique to each book. To further spice things up, Ms. Beaton always adds new layers to the village of Lochdubh and Hamish. He’s been through multiple work partners over the years; Hamish prefers to work alone and usually finds a way to help his partner move on to another occupation. The mystery is always fresh. Hamish’s complicated relationships with Priscilla and Elspeth seem to have quieted down in the last few books, leaving him open to new experiences (and less pining). This latest Macbeth mystery is what I’ve come to expect from Ms. Beaton – a cozy mystery full of familiar characters and wit. Hamish and his constable, Charlie, are invited to spend the night at an old castle in the hopes to catch a ghost (most likely the wind) and end up with a dead body of unknown origin instead. Which promptly goes missing. As always, my favorite part is getting to spend time in Lochdubh. The majority of Death of a Ghost is centered nearby in a neighboring village on Hamish’s beat. We get to catch up with a few familiar faces from previous outings, but I could have used more time with the villagers for sure. I also used to really like the character of Jimmy and his off-the-record talks with Hamish, but in this book he is starting to feel a bit like Blair instead. While new readers won’t necessarily know the backstory of Hamish and his relations with various characters, they should have no problem picking this book up and enjoying the characters and the mystery. For those of you familiar with Lochdubh, it’s another fun outing with Hamish. Many thanks to NetGalley for providing me with an advance copy of this book in exchange for an honest review. Love your list of “expected things” in any Hamish Macbeth novel. They are exactly what keeps me coming back! 🙂 I’m halfway through this one now…. I’ve read a couple of Hamish books and really enjoyed them. It’s a series I really need to get back to and one I’d love to start at the beginning with.